During the two weeks of my work experience at Slightly Foxed, there was one thing on my list of things to do that I really had to do – even if it took me all the way to the other side of London following a complicated route chosen for me by the Transport of London website – and that was to visit The Slightly Foxed Bookshop. Located a stone’s throw from Gloucester Road tube station, the shop is very easy to find, even if you are new to London and useless with a map! As an added bonus, there is also a conveniently placed Caffè Nero next door so that you can enjoy a well deserved hot drink whilst reading through your purchases. 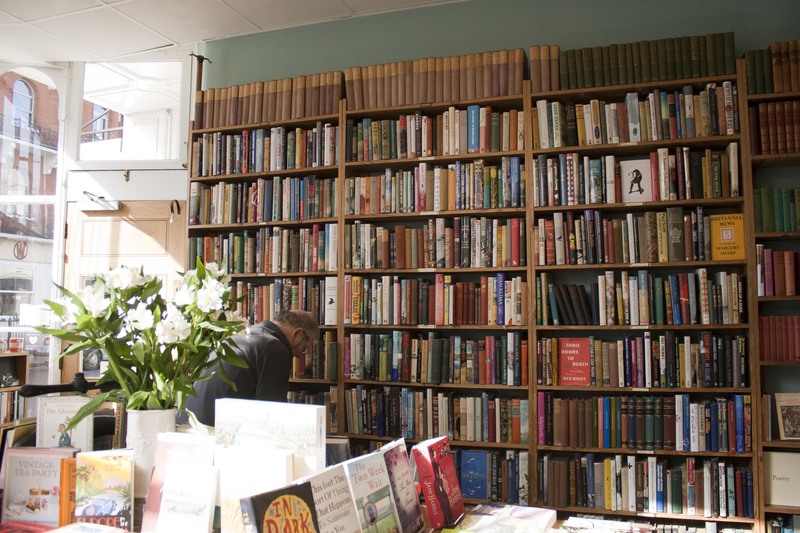 The shop was originally Gloucester Road Bookshop, owned and run by Graham Greene’s nephew, until Slightly Foxed – the ‘real readers’ literary quarterly magazine took it over in 2009. 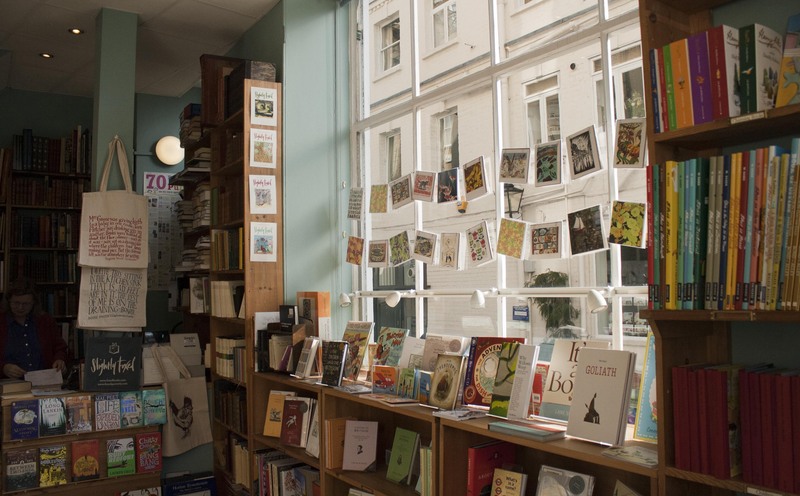 In the few years that it has been open, it has become a much loved part of Gloucester Road, holding events and launches, not just for Slightly Foxed’s own editions and magazines, but also for other like-minded publishers such as Candlestick Press. From the outside, The Slightly Foxed Bookshop is a promising sight; tastefully painted and with an attractive and simple window display, the shop looks clean, tidy and welcoming. There is also an enticing set of bookshelves, packed with an interesting mix of books and tempting offers. But if you can’t find anything outside, there is plenty to choose from inside. Entering the shop is like taking a breath of fresh air. From the moment you hear the tingle of the bell, you know that you are in good hands. It is neat and tidy with everything in its right place. Obviously a lot of care goes into maintaining the welcoming atmosphere; a thoughtful bunch of flowers brightens the centre of the room, making the customer feel at home and relaxed. Likewise, the displays have been carefully thought out and placed neatly in eye catching and browsable positions. There is a huge variety of books on offer. New mixed in with the old, forgotten classics and out of print books ranging from reasonable prices to expensive collectables. The staff are knowledgeable and friendly without being intrusive. If you have any bookish questions, one of them is bound to know the answer or at least be able to point you in the right direction. There is a bright children’s corner, filled with much loved classics as well as more recent titles and if you can’t find what you are looking for, this bookshop will do their very best to hunt it down and order it in for you! As well as books, there are plenty of other book related products; a colourful collection of mugs, book bags and beautifully designed greetings cards. Of course, you can also find the latest Slightly Foxed quarterly magazine and browse through the beautiful limited-edition hardback series of the Slightly Foxed Editions. 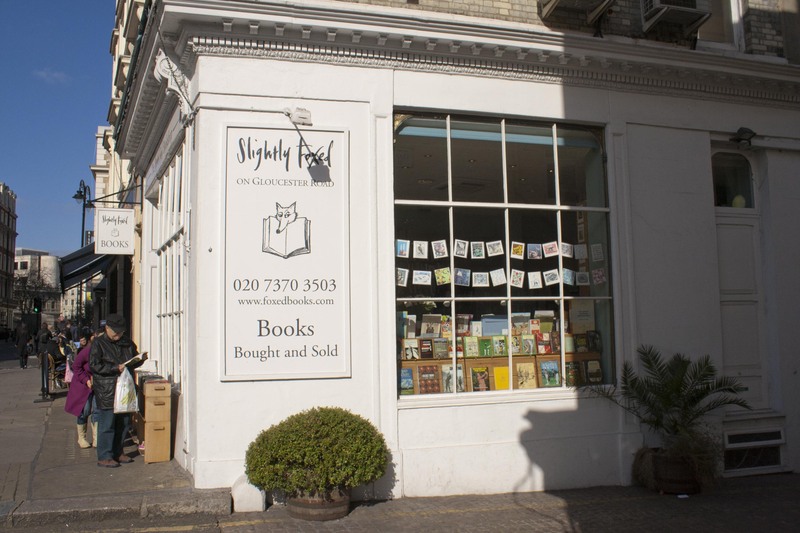 So if you ever feel like a break from the rush and frenzy of London, make your way to The Slightly Foxed Bookshop, where you will find the peaceful escape you need. Whether you have a specific book in mind or just want to have a chat about books with the friendly staff, you will surely feel a bit calmer by the time you leave! 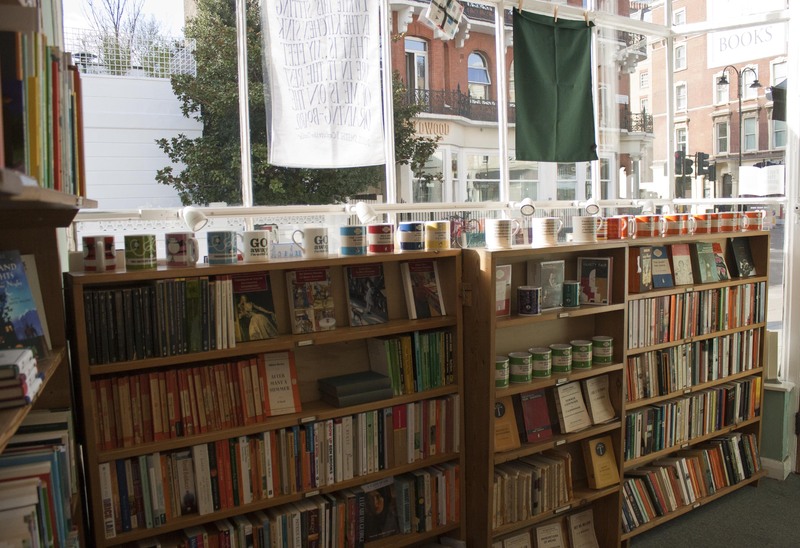 It may not be the cluttered chaos or dusty sort of bookshop that we all love, but The Slightly Foxed Bookshop has its own charm and is definitely serious about books. 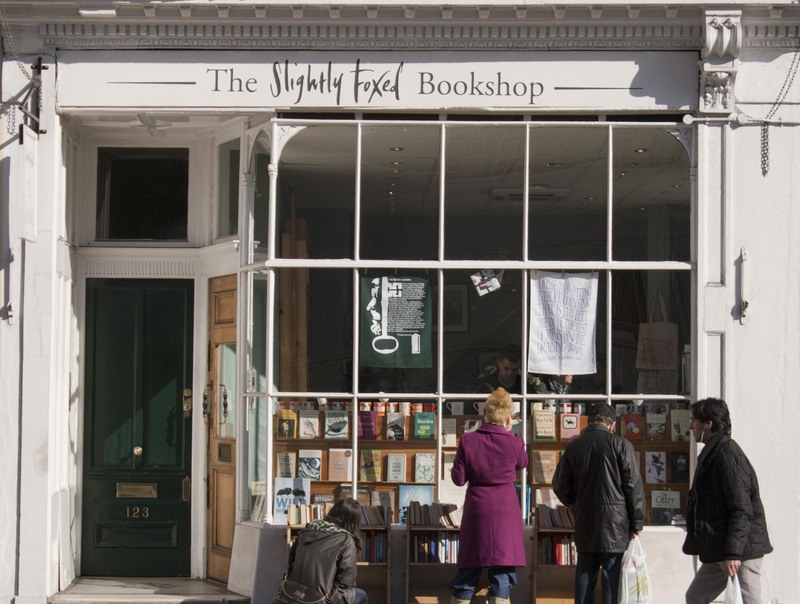 If you would like to know more about The Slightly Foxed Bookshop and keep up to date with upcoming events, take a look at their website. If you are in the area and feel like popping over to take a look, the address is: 123 Gloucester Road, London, SW7 4TE. If you can’t make it to the shop, you can always order books by calling them on Tel: 020 7370 3503. I just clicked on the Slightly Foxed Quarterly link and had one of those great coincidences – I’d picked up a copy of John Masefield’s autobiography Grace Before Ploughing and have been dipping in over the last few days thinking ‘No-one else is probably reading this anymore…’ and there’s a whole essay appreciating it in there, really heartening. A really interesting post, everything about the shop looks as good as their magazines. Thanks! I do love those coincidences! It shows that you are not alone! I think that essay is in the Spring issue, it sounds like a really interesting autobiography. That’s the good thing about Slightly Foxed – they don’t just write about new releases. In fact often you will learn about long forgotten books and although a lot of the books are now out of print, it’s still nice to read about them! What a shame that I’m on the other side of the pond– way on the other side. 🙂 This bookshop sounds like a cool place to visit. Definitely if you are ever in the area, you should put it on your list of things to do! Slightly Foxed is pretty close to being my ultimate bookshop! It is just a joy, and I try to visit every time I’m in London! I think I’m also going to have to try to visit every time I’m in London too. It is definitely worth the long journey across London from where I usually stay. Thanks for the comment! Obviously I’ve done that “if I had a bookshop…” daydream and this is kind of where I tend to end up. I love how light and airy it looks with fresh flowers – “breath of fresh air” for definite. I definitely have to visit here next time I’m in London, which admittedly isn’t often buy still…something to look forward to. PS. I love your blog picture. Wow I love it. I want to go now, I’ll add it to my list of places I NEED to go in Europe. Wow…that is just down the way from me and I’ve never heard of it. Thanks for correctly this issue 🙂 I’ll have to go!!!!!!! You’re so lucky living so close! I hope you enjoy it and find something interesting to buy!